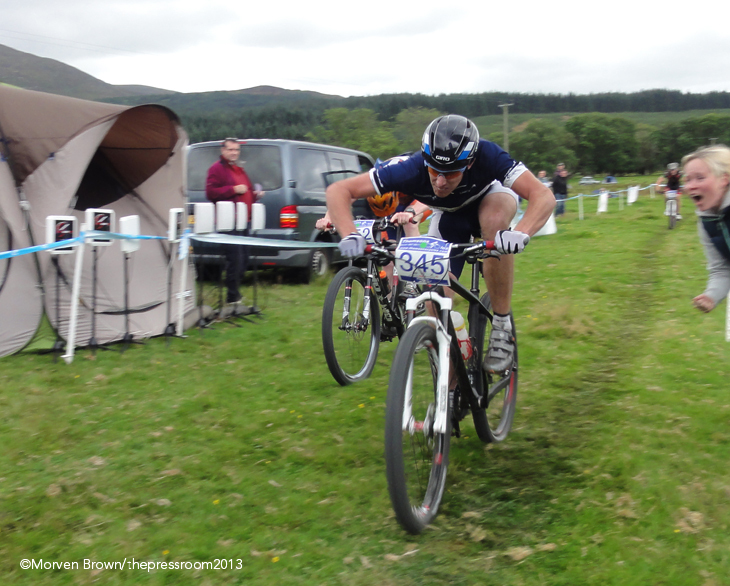 In the final race of the cross-country mountain bike season for Scottish riders, the great and the good of the Scottish mountain bike scene descended on the 7stanes venue of Kirroughtree for the final round of the Scottish series, incorporating the Scottish Championships. It has been a long and often tiring season for the Scottish riders, with most travelling vast distances down to England for the National series each month, including Cornwall, Essex and South Wales. However, it was back to home soil, and the crowds of family and friends had gathered to take in the spectacle of the Scottish Championships in the hope that their loved one would be travelling home with a gold medal around their neck. Punctures were the order of the day, with incredible numbers of riders seen running to the finish, stopping with inner tubes half inflated or, worst-case, throwing the bike into the bushes and having a diva strop! The course had already taken its toll on riders, with some succumbing to injuries sustained from falls in practice on the Saturday. While the course may have appeared relatively straightforward, racers attempting to maintain speed up steep climbs with tricky rocky steps to be negotiated would certainly disagree. Likewise, to push the pace on the flowing singletrack sections took a high degree of skill to swoop past the rocks and roots that littered the trail and to carry speed with style around the vast quantity of tight turns. The value of pre-riding the course in Saturday practice should never be underestimated, and those riders who had taken the time to scope out the fastest, and safest, line through the technical sections reaped the benefits. Young Iain Paton (19) from Golspie was the 2012 Junior Scottish Champion, and made his first foray into the world of Elite racing at the 2013 Championships. Riding a storming race, leading through the arena on lap one with an 18 and a half minute lap, to coming home just one minute ahead of his nearest rival, the teenager picked up his first senior Scottish title. After an hour and a half of high intensity racing second place went to Rob Friel of Santa Cruz Cycles, already confirmed as Scottish Series winner with a resounding points margin. Unfortunately, a puncture put paid to a stronger challenge on Paton, however Friel showed his strength in an impressive chase in the latter half of the race. 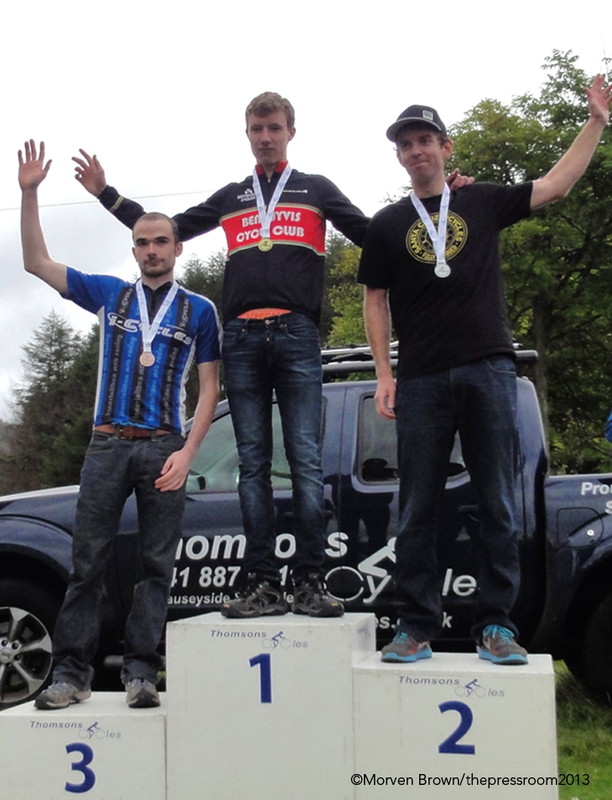 Third place went to Englishman Joe Norledge, with Scottish rider Douglas Shearer (Innerleithen MTB Racing) rounding off the Scottish Champions podium in third place. Stuart Wilcox (Scott UK) romped home in the Junior category to take the victory with almost a 10 minute margin over his nearest rival Calum Russell (Ben Wyvis CC). In 2012, Stuart had a disappointing 5th at the Championships so took full advantage of the fine form he’s found at this late stage in the season. In the Junior Girls category, Isla Short (WXC Racing) built on an extremely impressive victory at the final round of the British series, to claim the Scottish Championships, with lap times so fast, they would have placed her second in the Elite category. There was last lap drama in the Youth category, as Calum Magowan, riding in the jersey of the British Champion for Team Peebles CC/Alpine Bikes, suffered a puncture. With second place, Pearce Sommerville of Rockhard MBC quickly catching him, Calum jumped back on his bike and forced the bike to the finish. Riding on a flat tyre takes extreme skill and leg effort, alongside the cost of replacing the now damaged wheel rim! 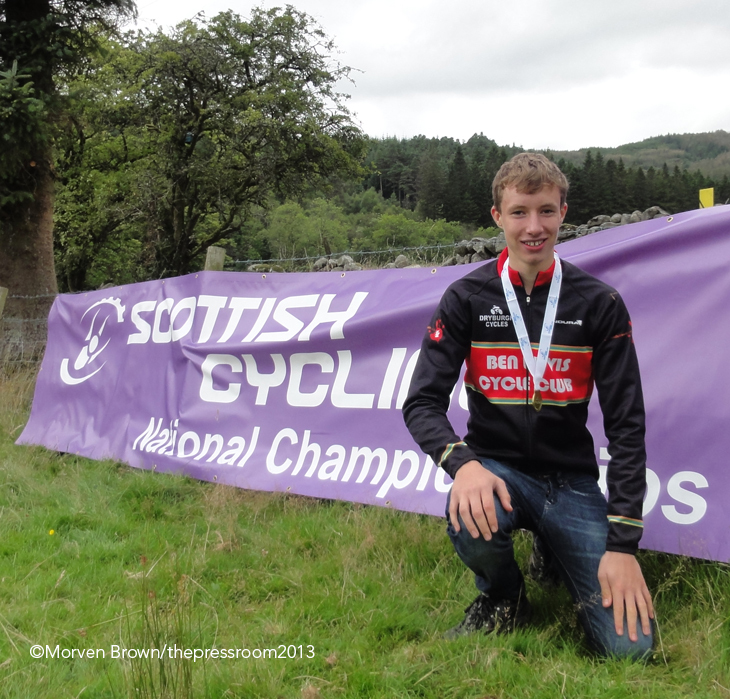 However, for Calum it was worth it and he took his second consecutive Scottish Youth Championship title. Sommerville crossed the line in second, only 40 seconds down on Magowan, with Elliot Metcalfe (Nutcracker Racing) in third. 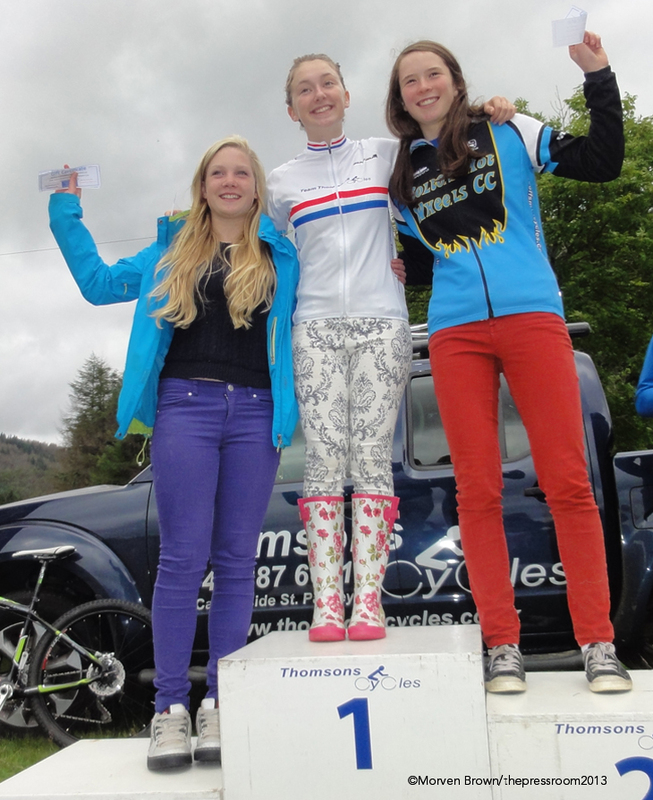 Another British Champion, Erika Allen (Thomsons Cycles), did the double, taking the Scottish title in a strong race ahead of Martha Gill (Bolton Hot Wheels CC), with Ella Conolly of Ben Wyvis CC only six seconds behind Gill. The cheers from family and friends as she came into the arena spurred Conolly on to chase down Gill, and perhaps with a few more metres she could have taken second. Juvenile was the largest female category of the day, with many young riders all hoping to head home with the gold medal of the Scottish Champion. The race itself was won by Rhianna Stoves, who came in over 30 seconds ahead of second place. However, as Rhianna, who rides for Derwentside CC, was not eligible for the Scottish Championships, the race was left wide open for the Scottish girls to scrabble over the honours. Katie Allen (Thomsons Cycles) matched her sister Erika and took the well-deserved victory, after what has been a long and successful season for the young racer. Fifteen seconds later Ellie Park (Glasgow Riderz) crossed the line. Only two months ago, Ellie had her arm in plaster. Third place went to Anna Kay. The Juvenile Boys was an even tighter race, with all three podium spots being settled within ten seconds of each other. Only one second separated the first two positions after 45 minutes of racing. 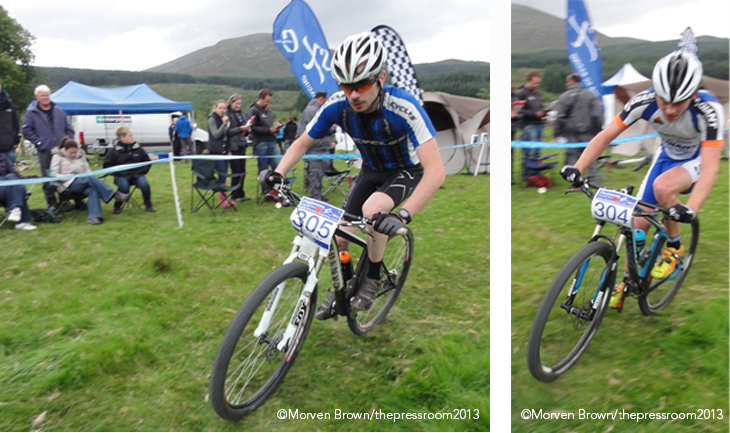 Conner Johnston of Team Leslie Bikeshop took his first Scottish title after two extremely fast laps, closely followed in by Sean Flynn (Edinburgh RC). Less than 10 seconds later Steven Dent from Nevis Cycles crossed the line in third place, which as part of a season involving travel to southern England for races, will be well appreciated. The Master category has been one of the most exciting races to watch all season, with a different winner each time, and regularly five different men all capable of taking the victory. In the end, it all came down to a sprint finish for the Championship. Roger Campbell Crawford (Thomsons Cycles) and Ewan Gronkowski (Mukyriderz) have provided some excellent racing throughout the year and it was a fitting end to their season to have such a fine display at the championships. After four laps of the challenging Kirroughtree course, Campbell-Crawford seized the victory, with an impressive lunge for the line. Gronkowski had to settle for second with Alexander Paterson (Alf Jones RT) rounding off the podium only three seconds behind. 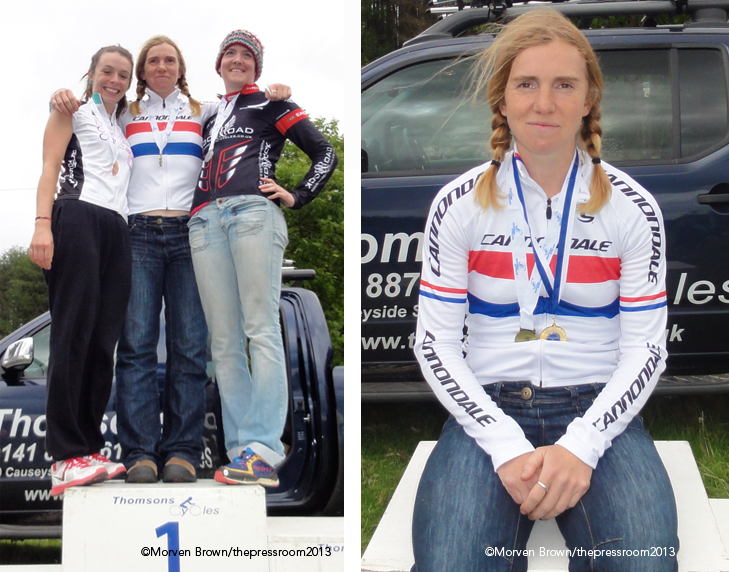 Gillian Pratt, another Team Leslie Bikeshop rider, made amends for missing out on the gold at the British Championships in July to take victory in the Scottish Championships for the second year in a row. Louise Allen (Mukyriderz) was second. Another close race in the Veterans category saw Gary McCrae open up a one minute gap over second placed John McCaffery. Third spot went to Damien Slorach, giving Team Leslie Bikeshop all three podium places. Anne Murray (Team Jewsons) took the female title, having spent the previous week in South Africa competing – and claiming a highly respectable fourth – at the World Masters Championships. She was followed in by Alison Rushton to complete the podium. Gregor Grant (Moray Firth Cycling Club) made it an impressive six wins from six in the Grand Veteran category, sealing the Scottish Championships and the Scottish series. He finished an extremely comfortable 3 minutes ahead of Brian Garriock (Perth City Cycles) and Allan Laing (Velo Ecosse). John Shirley of West Highland Wheelers completed two tough laps of the Kirroughtree course to take the Championship in the Super Veteran (60+) category, proving that age doesn’t hinder a great performance! Fiona Paton (Ben Wyvis CC) set off in the Grand Veteran women category, and matched the performance of her son by also claiming the Scottish title, and showing that true mountain biking talent runs in the Paton family. There were also some fantastic results in the under 12’s race, where kids as young as three, and on push bikes with no pedals, take on a miniature version of the full course. Every child who takes part is always full of enthusiasm, and as well as having great fun, often sets out to be first across the line! The young generation is an important feature of the Scottish Championships as they develop their talent and gain inspiration from being part of such an event. In all, it was an extremely tough and testing day on the bikes and there was a lot of respect to any rider who completed the course with bike and body in one piece. By half past five in the evening all the course tape was taken down, the sign-on tents were packaged away until the opening race in March 2014 and the last cars were leaving the car park. It had been a fantastic day of bike racing, an excellent spectacle for spectators and a delight for the organisers. And then that’s it all over for another season. Fifteen riders heading back home with Gold Championship medals, smiles on their faces and that winning feeling. Two hundred others with the satisfaction of knowing that they took on the tough Kirroughtree course, completed the Championships, and that there’s always next year!